After the "heavy " breakfast, my eyes also "heavy. "Read" a bit of Lao Fu Tze comic, then the comic start reading me pulak. By the way, don't worry. Am wearing my seat belt..the lower part. 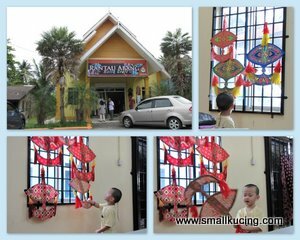 Papa brought us "gai-gai" at Marang coz Mamarazzi remembered that Auntie Little Bird asked her to help to buy some "Salted Fish. Hmmm....couldn't find any. But there sure a lot of fishermen there doing their stuffs. 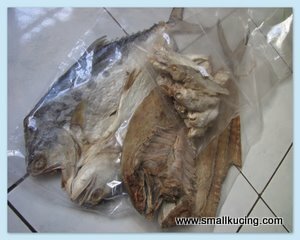 In the end, we just stopped at one of the stalls along the main road to get some Salted Fish. Hmm...not bad. Not that pricey also. 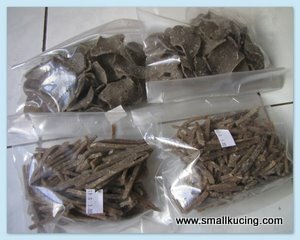 Got some of the Keropok Keping too.It's basically Fish Crackers. After fried, it will taste good. Next stop was Rantau Abang. Mamarazzi wanted to get Batik Cloth for a friend. This humble hut have been here for decades. At the side of the hut is the "workshop" where they paint the Batik cloth by hand. 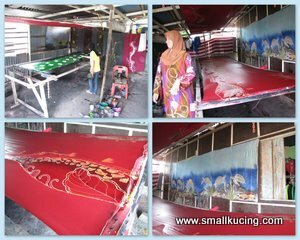 Hand painted cotton batik cloth will be less than RM100 a piece but if you were to get hand painted Silk Batik Cloth it would cost more than RM200. Very seldom to be able to find hand painted Silk Batik for RM200 and less. It's interesting to see how they paint the cloth. *Snuggle*snuggle* Keeping quiet* Mamarazzi bought me a small Wau Bulan made of cloth. Ya, I know this Wau can't fly but it look nice as decoration. 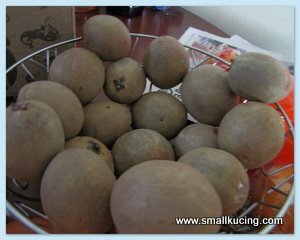 Next stop was to get some of the super sweet Ciku (Manilkara zapota, commonly known as the sapodilla). Hmmm....this round the size of the Ciku sold were kinda small. Previously, Mamarazzi could get 3 piles which consist of 5 to 6 Ciku a pile for RM5. However, this round the Vendors insisted RM2 a pile and the Ciku were not that nice. Those big and nice ones were being sold per kilogramme instead. RM6 a kilo. Guess, they know that it's tourist season. Saw the same stall also selling some durian. RM5 a fruit. 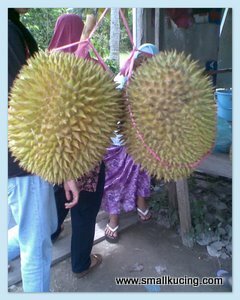 Mamarazzi didn't buy thinking that down the road towards Kijal there will be more Durians and cheaper. Eventually we stopped at one of the road side stalls at Kijal. Gosh! It's more expensive here! These two going for RM25! Aiyo...super regret didn't buy at the earlier stall. Papa was clever. He managed to bargain down the price to RM42 for 6 durians. We went to Kor Ko Jon's house to have Durian Feast! Before the durian feast , we had Nasi Biryani Feast pulak. Sorry, no photos as Kor Kor Jon's relatives were there. Shy shy to snap photos. Mmm...yummy creamy Durian Kijal! 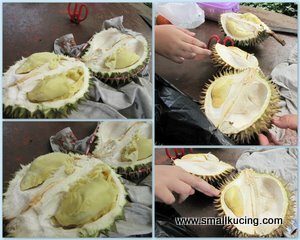 We managed to walloped 3 durians only before we were stuffed to the brim. At the 3 opened durians were very good. The taste were strong and a lot of pulp. While waiting for the food and "fruit" to digest, I had a great time playing bubbles with Baby Isaac. There were 3 very cute doggies too. Wish I can stay longer but the journey is going to be long and heavy traffic expected. Awesome journey you did, so much to buy and those salt fish I cannot resist. Those fruits looks so good but durian is like once a while for me though I love tempoyak very much. Do you cook Durian, or just eat the inside raw? It's so different! Those fish crackers look interesting too. Road trips like this is fun. Smallkucing is such a good boy as he can sit alone at the back seat. My princess won't let me sit on the front passenger seat... must accompany her at the back seat all the time! Indeed a fruitful journey, eat buy eat buy! Ooo didn't know you like. Else get some for you.